Okay, I’ve got to admit: this product was sitting in my fridge for at least a month. When it comes to vegan (processed) alternatives it’s either a HUGE hit or miss. So, I take my time with these reviews, just in case I need to prepare to dry-heave. …Except for the Beyond Burger – that ‘ish is legit. VeganEgg is made from Follow Your Heart. They have a lot of great products, so I was pretty curious about their egg alternative. First, I want to kind of just describe the experience, then I will get into the review. Daleeee. I whisked about 2 eggs worth to start out with. This required 4 tablespoons of the dried egg-like product along with 1 cup of chilled water. When I started to whisk away, I noticed it had a slight eggy smell. More like the smell you get from the yellow part of the egg. Also, whisking was easy. It didn’t have the same stretchy texture as eggs normally do before you cook it, but I wasn’t worried. Also, I have a good feeling this egg alternative is great for coating foods before dressing it up with breadcrumbs for frying. I will have to try that out! I added a little bit of vegan butter to the pan. And once I poured the egg-like mixture into the pan, it immediately start to bubble and cook. But don’t be fooled…it takes a little bit of time to actually cook these eggs all the way through. The package recommends cooking for 6-8 minutes. However, I cooked mine for a little over 10 minutes. You want them to be firm. It took awhile to cook, but it’s totally not a big deal. I noticed as I was cooking the vegan eggs, they began to lose their eggy scent and became a little more nutty. I was slightly disappointed, still, the world didn’t end or anything, so it’s okay! 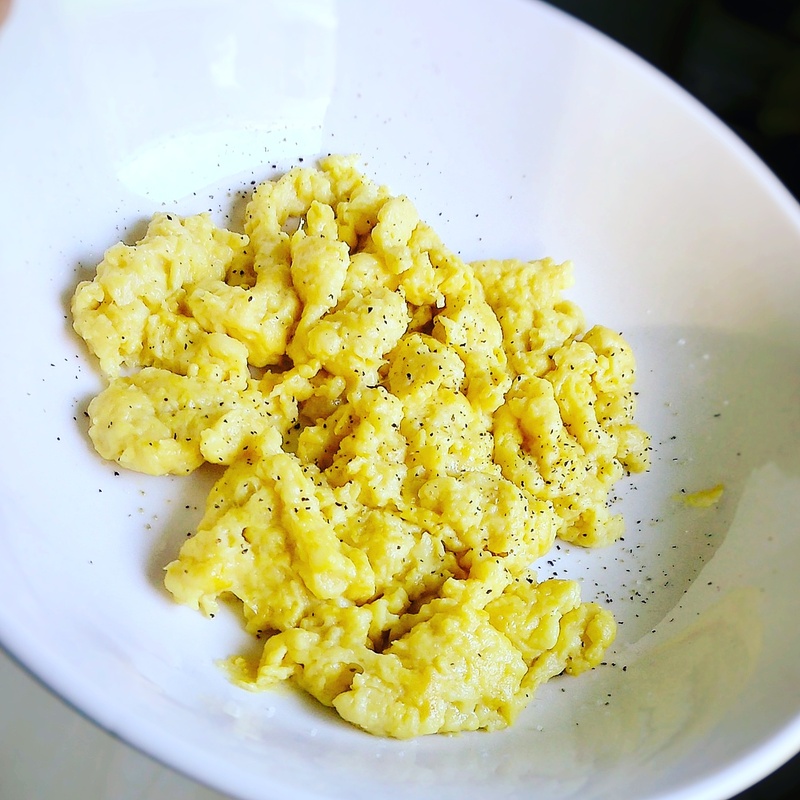 Texture: The final product of these vegan eggs were a little more rubbery than your vegetarian eggs. I tend to like my eggs a little firm, but it didn’t seem like these vegan eggs were going to get firm. But I did the best I could! The texture was also a little sticky. Smell: Initially when you whisk the vegan egg batch, it had a nice egg-y smell. However, after cooking for a bit, the smell became more mild had a nutty scent took over. The great thing is that it didn’t smell terrible. It was mild and that’s something I can definitely deal with. Taste: The taste, along with the smell, was slightly nutty and very mild. You really do need to dress these vegan eggs up. They do not taste like very much. Even with a great amount of salt and pepper, it didn’t taste like much. I’d suggest really going all out with these eggs and include perhaps veggies, vegan sausages, garlic, and a considerable amount of sriracha. Overall: These weren’t bad. I can definitely see myself buying this product again. They didn’t taste exactly like eggs, but they taste OK. I just suggest dressing up these eggs as much as you can, unless you’re okay with the blandness. Also, I will give updates on using this mixture for frying! From a 1 to a 10, I give this product a 7.